Dunfermline MSP Bill Walker said: “This is a great opportunity for people to get involved in Homecoming 2014. With the world’s eyes on Scotland in 2014, we have a chance to really boost the profile of Dunfermline. 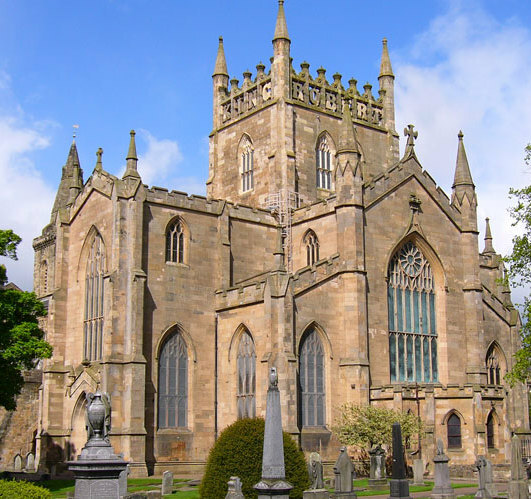 “King Robert the Bruce, the hero of the famous and decisive Battle of Bannockburn, is of course buried in Dunfermline Abbey, so it is absolutely fitting that Dunfermline should play a major role in the Homecoming 2014 events. “Our ancient city is steeped in history, with a heritage quarter that includes the Abbey, palace, Abbot House and Pittencrieff Park. As well as being the final resting place of the Bruce, the Abbey is the burial place of an abundance of kings and queens. “Dunfermline also has excellent transport links to other Homecoming sites in Scotland, including Bannockburn. “I very much hope that the many people and organisations who work so hard individually to promote Dunfermline will come together to achieve their objectives for Homecoming 2014. Very close cooperation will, I believe, be essential if Dunfermline is to be a star attraction. The integrated and highly successful approach of the Edinburgh Festivals has been suggested as a perfect model to consider. The Dunfermline 2014 website will launch shortly at www.dunfermline2014.com.